Lucky Angler is a five reeled pokie game by Net Entertainment that offers players a grand adventure as it invites them to join the Lucky Angler who travels across the Arctic Ocean to get the big catch. So if you are a fishing fanatic, then you will surely get to enjoy this game that has a fishing theme. Players are not only going to join the Lucky Angler for a fun ride, as they would also get to claim plenty of great prizes and fortunes that they come across during their adventures in the arctic. The game offers such experience in a 5 reeled setup that is home to a total of 15 lines that can give out massive rewards. Players will earn a payout whenever they manage to get 3 matching icons from the left to the right on the game’s bet lines. All of the different payout that the game can give out can be viewed by players during the game play through the pays table of the pokie. Since the game has an arctic theme, players will see that the reels are located on a frozen arctic land with a lake with wild fish in the background. All of the symbols that are going to be landing across the reels are heavily inspired by the theme of the game as they include shoes, fish bait, golden fish, red fish, crabs and poker card icons that come made out of ice. Of course, it goes without saying that all of the visuals that are going to appear across the reels come in high quality, courtesy of Net Entertainment. Lucky Angler comes with a wild icon, which comes in the form of the golden fish bait. This golden fish bait can substitute for all other icons across the reels of the game. It is a sticky wild as well, and it can land on reels 2 and 4 during the base game play, and it can on reels, 2, 3 and 4 during the free spins round. The sticky wild that contributes in creating a win will remain in its position until there are no wins. The wild icon will not replace the scatter free spins icon of the game which comes in the form of the silver school of fish. This scatter icon can trigger the free spins round whenever lucky players manage to get from 3 to 5 symbols anywhere across the reels. The amount of free spins depends on the number of scatters as players can claim from 10 to 20 when they get from three to five scatter icons. 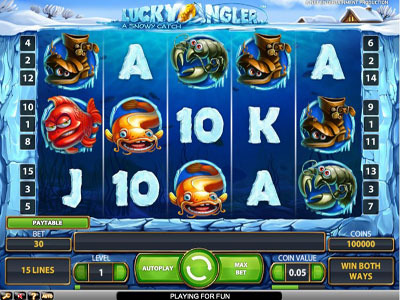 Lucky Angler is a 15 lined, 5 reeled pokie game by Net Entertainment that invites players to enjoy an arctic themed fishing adventure. The game is packed with generous line pays as well as a great set of special features that can give out a great set of rewards.